You are smothered in darkness. Something is covering you and it's too dark to see. When you escape the darkness, you discover yourself to be a baby, carrying nothing, in the middle of a living room. Pillows and other stuff are piled in a circular wall around you. The new mom is trying to get you to "pull up" by putting your favorite toy on top of a red footstool. You can also see a squishy ball and a book here. You want to get your favorite toy. The PC is a baby who hasn't learned to walk yet. The description of the toy, "the thing your aunt gave you which is a super fun toy", is a reference to the thing your aunt gave you which you don't know what it is from The Hitchhiker's Guide to the Galaxy (Douglas Adams and Steve Meretzky; publisher: Infocom; 1984). Child's Play (Stephen Granade; 17-Jul-2006; Z-code). Beta-testing by Dan Shiovitz, Sean Barrett, Lucian Smith and Admiral Jota. IntroComp 2006: First runner-up (of 7 games). Download introcomp06.zip from the IF Archive - all the games from IntroComp 2006. Note: The story file for Child's Play is Child's Play.zblorb. 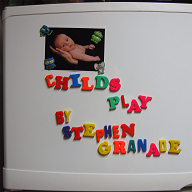 Child's Play (Stephen Granade; 31-Dec-2007; Z-code). Note: Release 3's release line wanted. Replace this line with that release's release line. XYZZY Awards 2007: Winner of Best NPCs. Also, finalist in 5 categories: Best Game, Best Writing, Best Puzzles, Best Individual Puzzle (getting the toy from the cabinet), and Best Individual NPC (Zoe). Or download ChildsPlay.zblorb from the author's site. Child's Play homepage. - Includes story file (Release 4 as of late January 2008), source code, cover art, and play-it-online link. Child's Play (archived) - at Baf's Guide. Child's Play - at IFDB. Review by Jess - at Jay is Games. Review by Emily Short - at IF-Review. Hints page - by the author. Walkthrough - by Grunion Guy. This page was last modified on 22 October 2014, at 21:23.